The CW240 power meter is a complete tool for enhancing energy efficiency, finding areas for improvement and assessing equipment lifecycles. The meter provides in-depth information on how an item of equipment, an area of a plant or a complete facility is operating that goes beyond simply measuring power usage. By using the supplied clamp-on components and probes, users can better determine maintenance, repair and replacement schedules for equipment such as transformers and motors. Information is provided with respect to load factors and demand factors, as well as current/voltage fluctuations at motor start-up. The CW240 offers many unique features to improve energy efficiency through highly detailed data collection and easy-to-understand displays. Measurement of Instantaneous Values: Unique 3-wattmeter display provides an immediate value for each measurement element (voltage/current/electric power, etc.) to allow users to cut energy costs through a better understanding of power consumption, maximum load factor and peak current. Power Quality Measurement: Measures and displays active power, regenerative power and reactive power quality—along with simultaneous displays of each value. 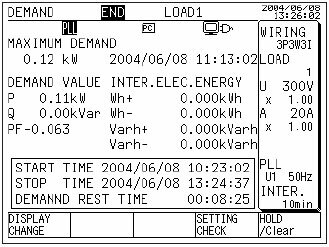 Demand Management: Enables users to set the desired demand limit in preferred time units in order to determine the maximum power demand. 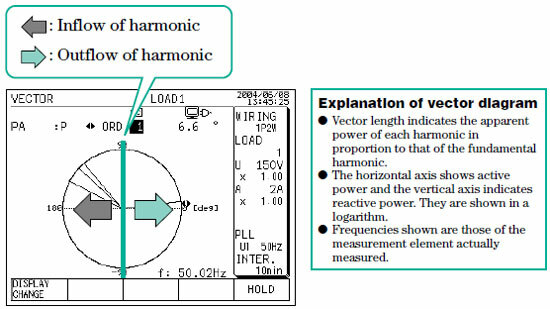 Harmonics Measurement: Reveals distortions in voltages and currents that can cause malfunctions and power loss. Measures harmonics from the 1st to 50th. User-friendly data display in list, bar graph (linear/log) or vector (inflow/outflow judgment). Waveform Measurement: Displays voltage and/or current of each phase in easy to understand graphs. Voltage Fluctuation Measurement: Detects time and date of each fluctuation occurrence, the fluctuation type, the rms values, and the start and end period. Better determine the maintenance, repair and replacement schedules for each piece of electrical equipment, such as transformers and motors, by analyzing detailed information with respect to load and demand factors. Review detailed information on current and voltage fluctuations at motor start-up. Improve power measurment and data collection for compliance with ISO14001 and other standards by showing exactly how and when power is being used. Power measurement is broken down into individual phases to provide a more comprehensive view of overall power usage. The CW240 also provides real-time and data log capabilities that are seamlessly downloadable into an available software package that can display graphs, trends and reports. 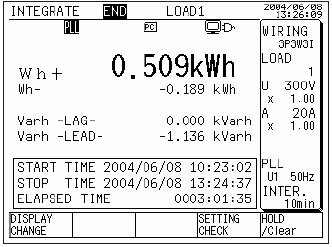 Investigate electric power consumption rate for an item of equipment, an area of a plant or a complete facility. Get data beyond the 30-minute demand time frame that most utilities use to obtain average power usage by setting the demand time to units of seconds or minutes. Power quality is an important and often overlooked element in reducing energy costs. If the power factor is not taken into account, an energy efficiency program could accidentally implement steps that increase the utility bill instead of lowering it. For example, replacing 100-watt incandescent bulbs with low-watt fluorescent bulbs saves energy but can worsen the power factor, possibly resulting in low power factor fines from the electric utility. 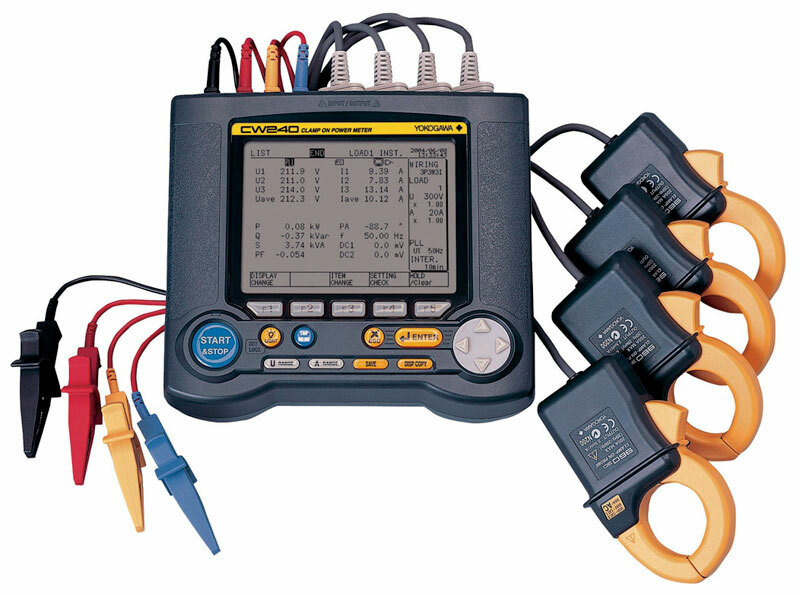 The CW240 also provides a demand feature that can be used to measure peak power usage over a specified time period. This data can be used to minimize peak power usage, or to shift peak usage to a more favorable time in accordance with electric utility time-of-day pricing. Obtain detailed date to ensure a smooth power supply for operations, and prolong the life of equipment by reducing the effects of harmonics. Inverter power supplies can cause distortions in voltages and currents, resulting in malfunctions, equipment damage and power loss. Therefore, it is critical to understand and monitor harmonics to ensure a reliable power supply. The CW240 provides displays of harmonics from the 1st to 50th for analysis to prevent problems. View in-depth information on waveforms through easy-to-understand graphs. Waveform measurement provides multiple ways to measure and analyze waveforms to see large waveform distortions that can indicate a potential problem in the system. Protect equipment from harmful power fluctuations by understanding exactly when and where these flucutuations occur. The CW240 detects dates/times of when fluctuations occur as well as the type of fluctuation, the channels where they occur, rms values and the periods between start and end. Once the voltage threshold is set, the fluctuations exceeding the threshold are detected. Functionalities unique to the CW240 make setting up and operating the power meter easy. Measure Loads in Four Systems Simultaneously: The CW240 enables measurement in four systems at the same time in a single-phase 2-wire system. In the case of a single three-phase 3-wire system, it can measure two systems simultaneously. Reduce Set-up Time and Errors: Its wiring check function prevents wiring errors and provides an easy to understand diagram for matching wiring. The setting check function prevents data acquisiting errors from mistakes in voltage range settings, current clamp selection or data save item. Measure Leakage Current : Proprietary technology enables measurements with a 200.0 mA range. Save Large Amounts of Data: Using an external memory card (compact flash) enables large amounts of data to be saved. Save Analog Data Simulataneously: The Input/Output Analog component enables analog data, such as temperature and illuminance data, to be saved simulataneously with power analog data. Power Supply Backup: In addition to the AC adaptor, NiMH battery pack (94004) or alkaline batteries (6 AA batteries) can be used to ensure continuous operation in the event of a power interruption. Multi Language Support: English, German, French, Italian, Spanish, Korean and Chinese screen displays. Manual Data Saving: Data for selected items can be saved or printed using the SAVE key. Screen Hard Copy: Displayed screen can be saved or printed using the DISP COPY key. Files are saved in bitmap format. Zoom Function: Zoom features for measured data of 5 items selected from instantaneous value and measured power quantity data. The CW240 enables measurement in four systems at the same time in a single-phase 2-wire system. In the case of a single three-phase 3-wire system, it can measure two systems simultaneously. Current clamp range/range can be set for each system. Measurement is attained of the current flowing in each load. Prior to start of measurement, the CW240 checks whether wiring is correct. Wiring errors, reversal of current clamps and phases to checked can displayed in a vector diagram to show errors and facilitate correct wiring. Settings made for data saving can be checked in the screen. This prevents data acquisition errors that may occur due to mistakes in voltage range setting, current clamp selection or data save item selection. Yokogawa's proprietary technology has achieved a magnetic field impact amount of 30 ppm even in adjacent power lines (at 100A). For use with the 2A current clamp probe (96036). Use of an external memory card (computer flash) makes it possible to save a large amount of data. A Yokogawa memory card of up to 512 MB can be used, and data is saved in an CSV format. In addition, the CW240 has a 1MB internal memory. Analog data, such as temperature and illuminance data, can be saved simultaneously with power can send data by using the analog input function (2 channels). The available input ranges are 100 mV/1 V/5 V. In addition, the analog output function (4 channels) can send data to an external recorder, allowing data duplexing . Output is +/- VDC. The analog input/output function is optional.